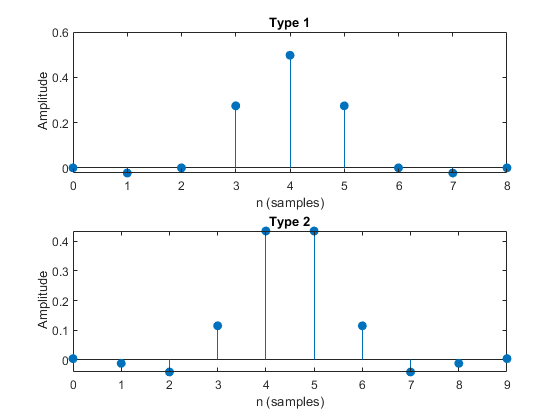 t = firtype(b) determines the type, t, of an FIR filter with coefficients b. t can be 1, 2, 3, or 4. The filter must be real and have linear phase. 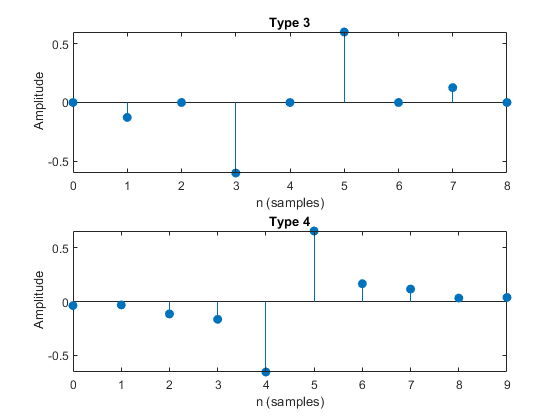 t = firtype(d) determines the type, t, of an FIR filter, d. t can be 1, 2, 3, or 4. The filter must be real and have linear phase. Design two FIR filters using the window method, one of even order and the other of odd order. Determine their types and plot their impulse responses. Design two equiripple Hilbert transformers, one of even order and the other of odd order. Determine their types and plot their impulse responses. Use designfilt to design the filters from the previous example. Display their types. Filter coefficients of the FIR filter, specified as a double- or single-precision real-valued row or column vector. A digitalFilter object. Use designfilt to generate a digital filter based on frequency-response specifications.